Since then, things have changed. There's a real push to move DR sites from a rack in a remote office location to recognized IaaS cloud locations. With that change comes new issues. If you are using your own servers in a colocation facility, or using IaaS VM instances, rack space for a physical router may either come with a price tag, or if it's all virtual, there might be no rack space at all. In my situation, I had two clients in this position. The first customer simply wanted to move their DR site from a branch office to a colocation facility. The second customer is a Backup-as-a-Service Cloud Service Provider, who is creating a "DR as a service" product. In the first situation, there was no rack space to be had. In the second situation, the last thing a CSP wants is to have to give up physical rack space for every customer, and then deploy CSP owned hardware to the client site - that simply does not scale. In both cases, a VM running a router instance was clearly the preferred (or only) choice. Virtual routers with enterprise features have been around for a while - back in the day we might have looked at quagga or zebra, but those have been folded into more mature products these days. In our case, we were looking at Vyatta (now owned by Brocade), or the open-source (free as in beer) fork of Vyatta - Vyos (vyos.net). Cisco is also in the game, their 1000V product supports IOS XE - their "bridge L2 over L3" approach uses OTV rather than L2TPv3 or GRE. You'll find that most router vendors now have a virtual product. The relevant configs look like the one below (just one end is shown) Note that this is not the entire config, and all IP's have been elided. Please - use our comment form and let us know if you've used a different method of bridging Layer 2 over Layer 3, and what pitfalls you might have had to overcome along the way! 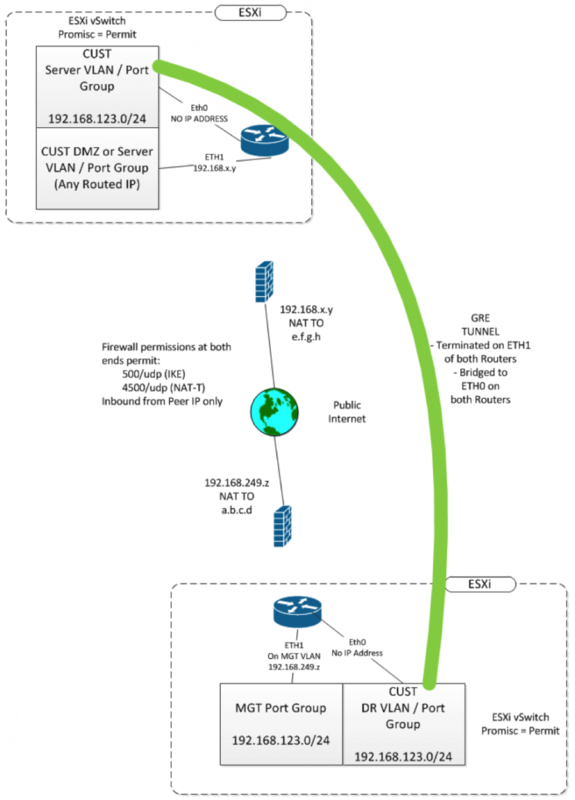 The ETH0 interface is on the server VLAN (or port group if you are using standard ESXi vSwitches) – this is the VLAN that you are bridging to the DR site. It is added to the bridge, and has no IP address. ETH1 is the management IP of this router, and is also the terminator for the GRE tunnel and the IPSEC VPN. You can split this up, many might prefer to terminate the tunnels to a loopback for instance, or add another Ethernet if you prefer. The GRE tunnel is also bridged, and also doesn’t have an IP address. The encapsulation of GRE-bridge is the same as GRE (IP protocol 47), but the “gre-bridge” encapsulation allows you to add this interface to bridge. This stuff is all important for your security posture, but is not relevant to the tunneling or bridging, so I’ve redacted it. The "traffic match" for encryption is defined by the source prefix+destination prefix+protocol. In our case, it's "the management IP of the customer router AND the matching IP on the cloud router AND GRE".